After many years abroad, Indian entrepreneurs have been returning home, in the belief their own country offers better opportunities. But little of the new wealth is spreading to the countryside where life has become harder for many. Climb the stairs to the roof terraces of many of the computer companies in Hyderabad and the view could easily pass for the Hollywood Hills. All around you are trees, several film studios and swish white-painted houses standing in their own grounds. Welcome to the Jubilee Hills, the smart end of the bustling capital city of the South Indian state of Andhra Pradesh. India is now famed for its call centres, providing employment for thousands of ambitious young English-speaking graduates. Yet things are moving on fast. I went visiting in November to find out more about the new wave of experienced Indian computer professionals who are returning home to start businesses, after years spent working overseas. As the managing director of Globarena, a computer learning company, Naren Ayyar told me not only does his firm put US university courses online so students can study them all over the world, but it has now branched out into devising the actual coursework to order. "What I learnt in America was to respect money. In India we used to have this social leftist hang up that money was not important. Now we realise what it can do. "I was also keen to put something back into life here, rather than staying on in the United States." It raises a fascinating question for Western developed economies. These entrepreneurs have returned to India because they now think the business prospects are better in the East than the West. I met up for an all-American pizza lunch with Sam Balaji, a partner at the accountants and business consultants Deloitte. The firm has moved into one of the city's many impressive new glass and steel offices. And Mr Balaji has moved back to India with his family. He says a lot of things take a bit of getting used to, such as having to negotiate water buffalo during his morning commute. 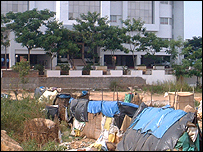 This being India, there are dozens of families camped out under tarpaulins, living in the open within yards of many of these new buildings. 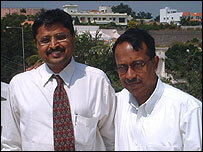 Mr Balaji has just shifted an entire back office department from the US to India. It is the kind of outsourcing, or off-shoring which US presidential candidate John Kerry was fretting about. But Mr Balaji said the trend was unstoppable, and there are enormous benefits for Deloitte and its customers if each regional office in the world concentrates on the tasks its workforce are best equipped to do. 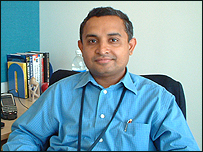 At another software house, ATI Technologies, I was astonished to find that the founder of the company in Hyderabad, Dasaradha Gude, grew up in an impoverished remote village, and had never even set eyes on a computer until he was 19 years old. Now his firm is designing the next generation of computer chips to be found in our mobile phones. He attributes his success to hard work and what he picked up working for large companies abroad. But what we sometimes forget about India is that while, say, a couple of million people may be enjoying the fruits of new-found prosperity, a billion are still living in poverty. 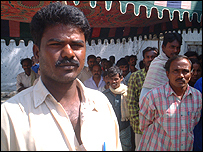 At least 70 million of them are in the Andhra Pradesh countryside surrounding Hyderabad. I linked up with the British-based development agency Action Aid to make a five-hour journey in a jeep to the remote village of Haripeerala. Here, living standards are falling, not rising. The trouble springs from the fact that most people have moved away from growing crops to feed their families. Over time they have become acutely aware of the world beyond their villages, of the things they could buy if they had money to spend. So they have switched to growing crops they can sell in the markets. But these crops - like rice - need a constant supply of water. 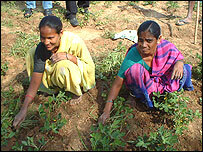 "People have moved to growing cash crops like cotton and chillies to earn money. But we cannot sustain ourselves on that. "We cannot get even an average price for what we grow at market. Seeds are expensive, as are pesticides, which often do not work very well. "For the last four years we have suffered from acute drought. Water levels have gone down very badly and we often have no water in our wells." Hundreds of farmers have committed suicide in this state in the last few years, many after running up huge debts with money lenders. It is no wonder that increasing numbers are leaving the land and are heading towards the cities. I discovered children as young as 10 working in a brick kiln in the village of Dundigal. The workers earn the equivalent of just one US dollar a day, which is well under the minimum wage. For me, it all puts the excitement about the country's economic growth in a new light. India's new private wealth is very real, though from what I saw for myself it does seem unlikely it will be shared more equally in our lifetimes. BBC Radio 4's Crossing Continents was broadcast on Thursday, 2 December, 2004 at 1100 GMT.